It’s been a while since I succumbed to some good old new-foody-place hype, especially within the London burger invasion realm: I was over that trend before it even started. 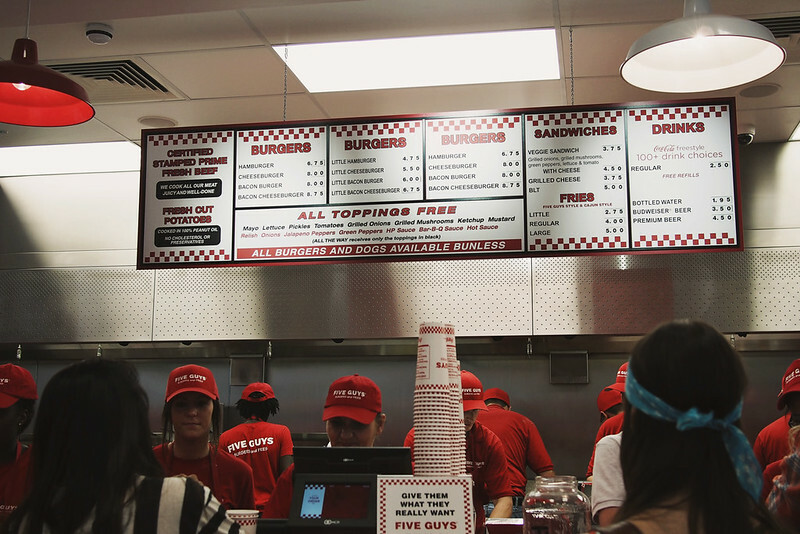 But last Thursday – the 4th of July – the stars and stripes aligned and I found myself in a sunny queue for Five Guys in Covent Garden with the lovely Bee. It seemed doubly appropriate as the last time I saw Bee was in a San Francisco diner, so where better to catch up than a Stateside burger place on our home soil? It seems like they’ve gone all out for the first London branch of the franchise: everything from the sunny staff to free shell-on peanuts to the Coke Freestyle machine (where you can mix up to 125 unique flavours of pop) has been imported over to this corner of Long Acre and St Martin’s Lane. Our 25-ish minute wait in the queue was no hardship really as Bee and I had a lot of chatting to catch up on, and the girl in front of us went on a beer run so we enjoyed a pre-burger tin in the evening sun. 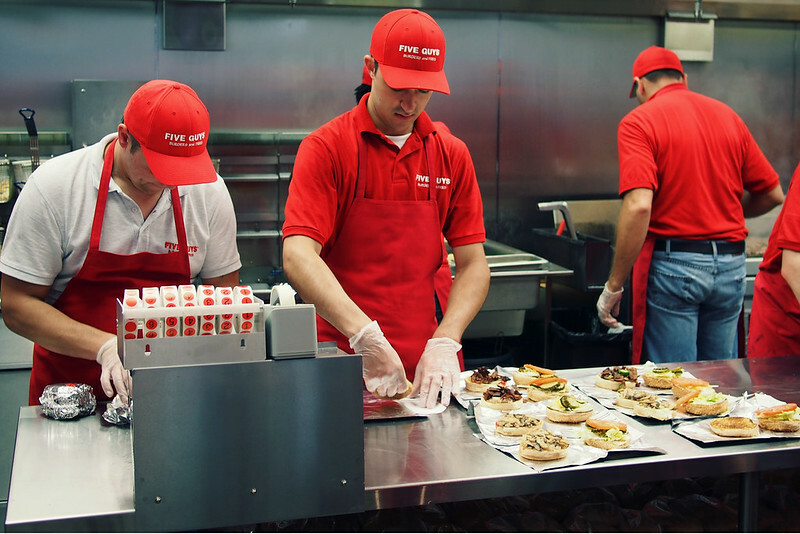 The menu’s small but big on choice, with all extra toppings and unlimited sauces thrown onto your burger for free. 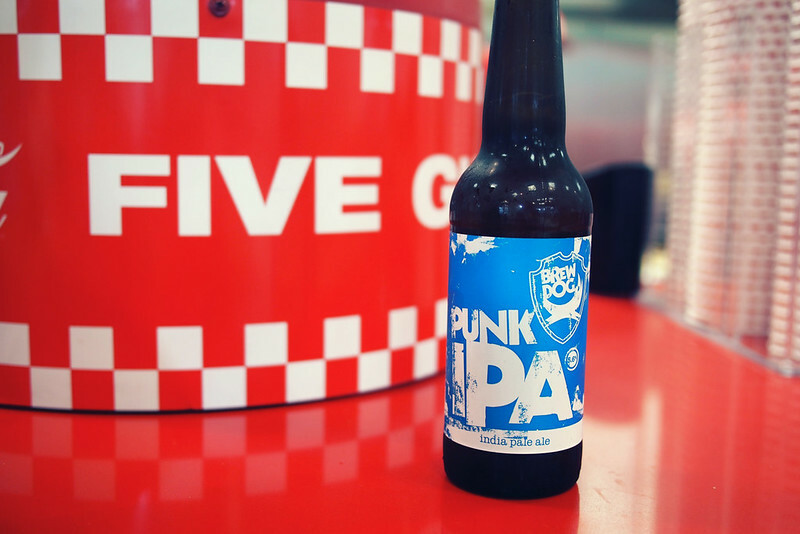 I was pleased to see they eschewed the US-is-best rule for the beer, with Brewdog Punk IPA available as well as Brooklyn lager. Let’s just ignore that top row. The queues were well managed and staff were obviously being careful to not let it get too crowded inside. Burgers and beers procured, we found a whole large booth in a tucked-away corner to ourselves, and stayed chatting long after our food had gone cold without feeling like we needed to move on. The food itself? I went for the veggie sandwich, a medley of grilled mushrooms and onions with lettuce and tomato, topped with optional (who says no though?) real ‘merican melted cheese, all in a squishy-sweet bun. It was pretty finger-licking and had some addictively tasty seasoning that saved it from blandness. We foolishly got a large fries forgetting that American portions are on the ridiculously huge side of ridiculously huge. They’d gone cold and unappetising long before we could even finish the spares floating around in the bag, never mind the supersized cup. Will I go back? Yes, probably, as I’d like to try the grilled cheese and Cajun fries, and also have a pop at the Coke Freestyle machine. The food’s pricey for what is essentially dirty diner food – albeit made fresh with good ingredients – but it just about passes the worth-it test for the bright, fun ambience and authentically Stateside feel. I’ll be interested to try other recent US import Shake Shack‘s veggie offering (also a mushroom-cheese concoction) soon to see how it compares. 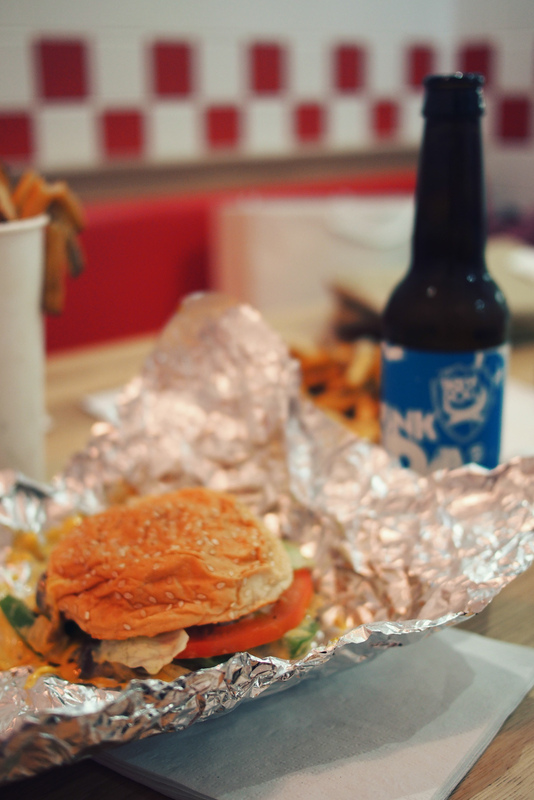 You can read some more great reviews of Five Guys on Street Feast and Like a Skeleton Key. I do love a dirty diner dinner sometimes. It looks like fun! 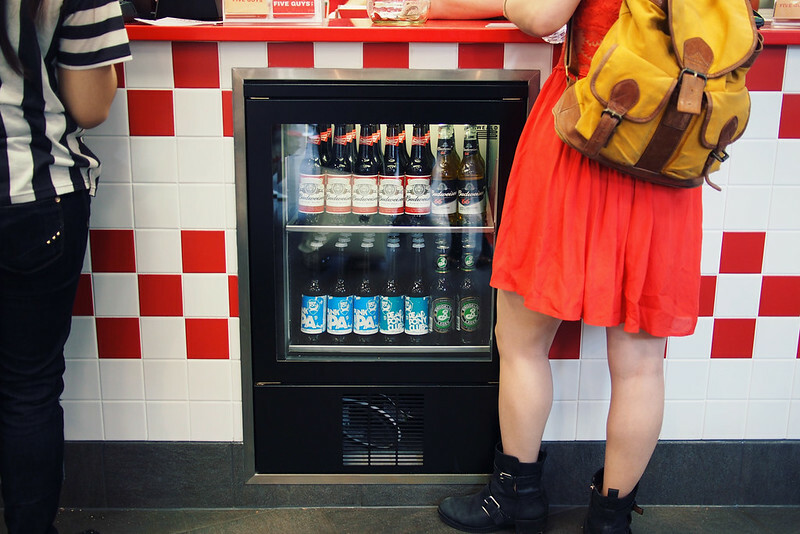 I’m particularly intrigued by the coca cola freestyle machine. Might visit just for that! Ooh, this looks pretty cool. 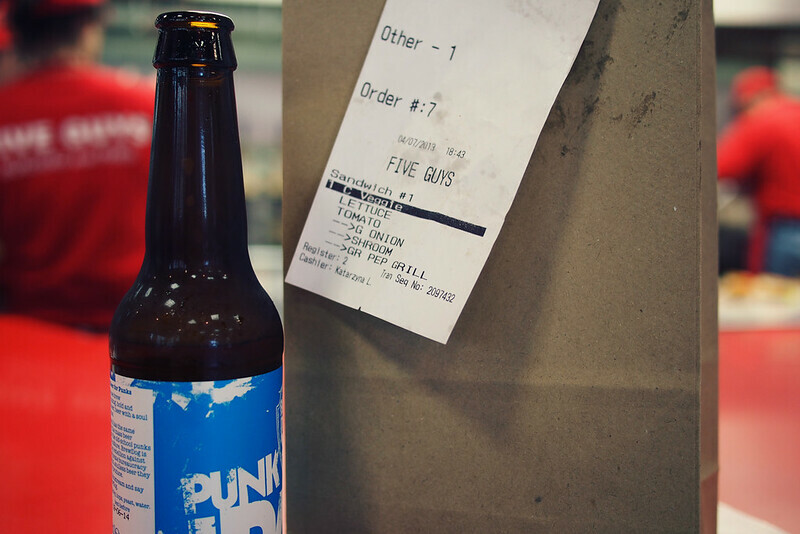 I love a good burger, might have to try this out next time I’m in London. Five Guys fry portions are ridiculously ginormous even by American standards. 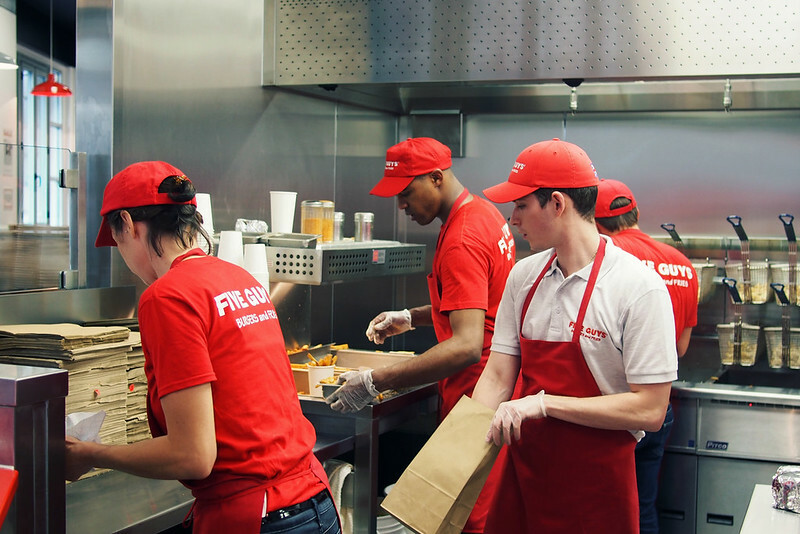 Ours have finally started offering a smaller portion (forget what they call it) – but if you don’t have that option, here’s a tip: order the fries with “no topper” and they will just include whatever fits in the cup and not dump a bunch extra on top. 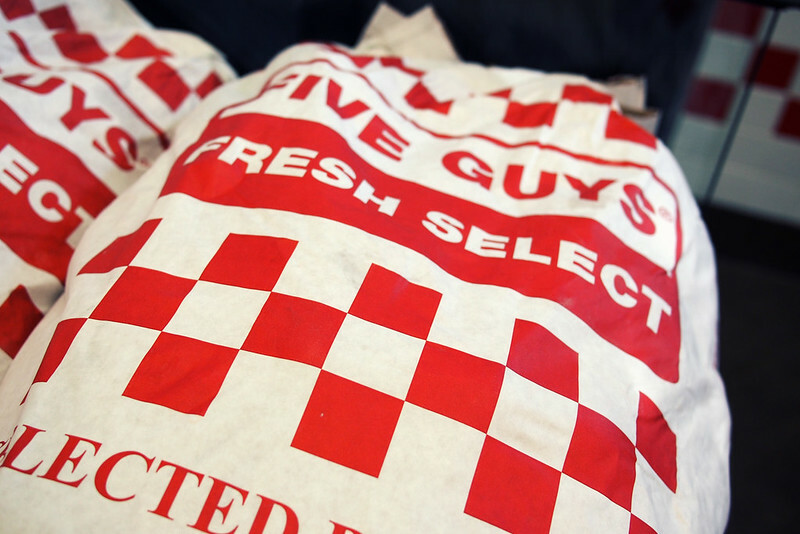 I am American and a big fan of 5 Guys! 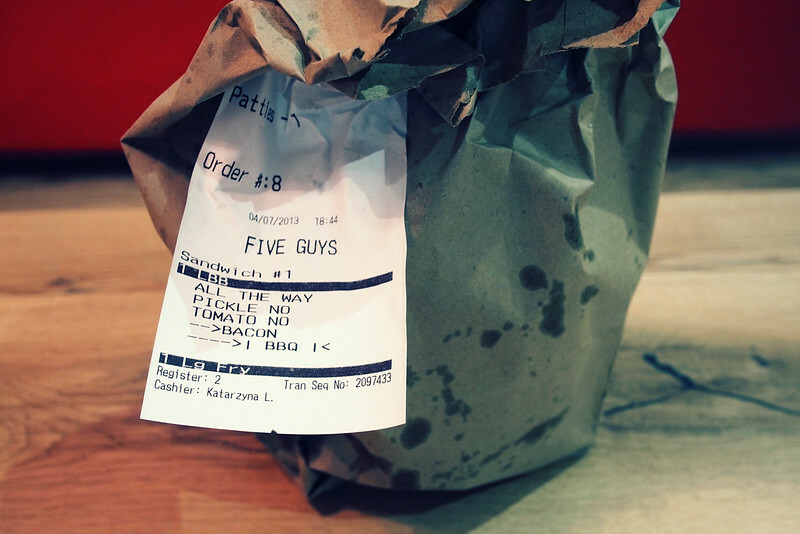 I would like to point out that the portion of their fries is just particular to 5 Guys. Not every burger joint or restaurant in the U.S. offers portions as generous. On the contrary, a lot are cutting back on portions! 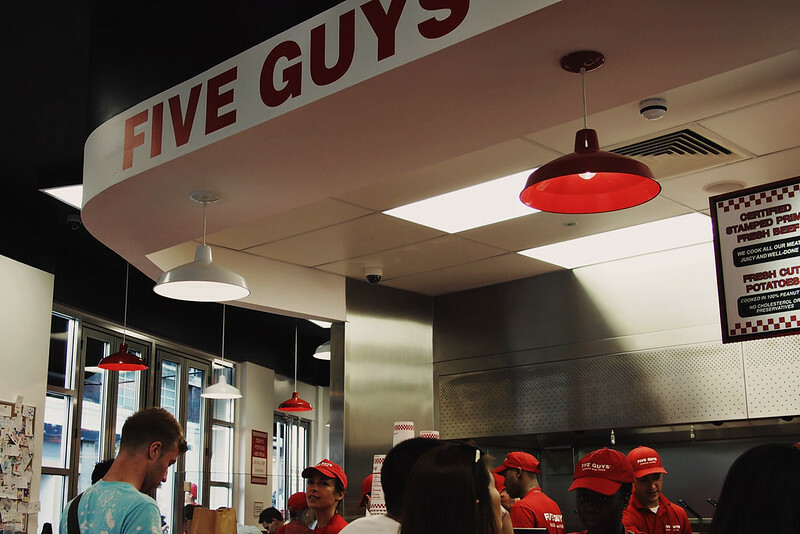 Even 5 Guys has cut back some (at least in the U.S.). When 5 Guys was new in my hometown the guy that took our order informed us that one regular order of fries would feed two. Otherwise we wouldn’t have known it..
Hi Katie, wanted to thank you for this review because it ended up on my ‘todo’ list when I was in London yesterday and it was a great experience and the tips in your comments about portion sizes were also very helpful! It was a long wait but it wasn’t a bad wait, it was fun to see everything that’s going on and the interaction they have with customers. It also tasted great, and I wanted to try all the soda options but had more than enough after 1,5 cup. Maybe next time.. Also, free peanuts!